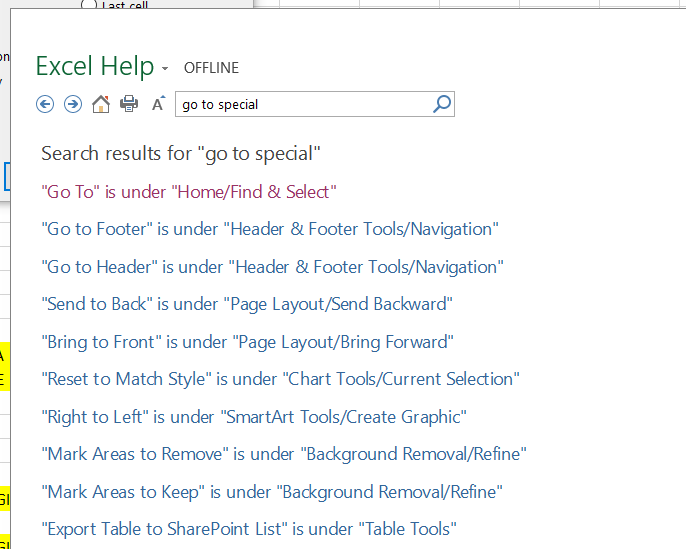 That’s it, the full extent of the offline help: the Find and Select function lets you find and select things. It doesn’t even mention using the F5 key, let alone give any details on the “Special” options. Using the online help works better. 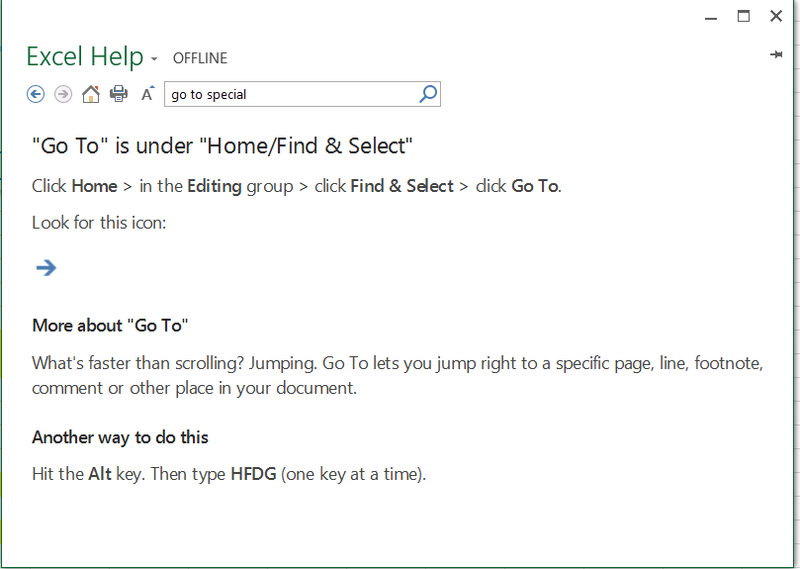 It takes you straight to help on using Go To Special, and it gives a reasonable amount of detail (although still no mention of the F5 key). One of the things that made the Lotus 123 spreadsheet so popular in the early days of personal computing was that it gave near instant helpful and relevant help at the touch of the F1 key. Now more than 30 years later, in spite of processing speeds and available storage increasing by factors of thousands, the help available in Excel doesn’t come close to matching what we had then. The table is instantly filled as required. 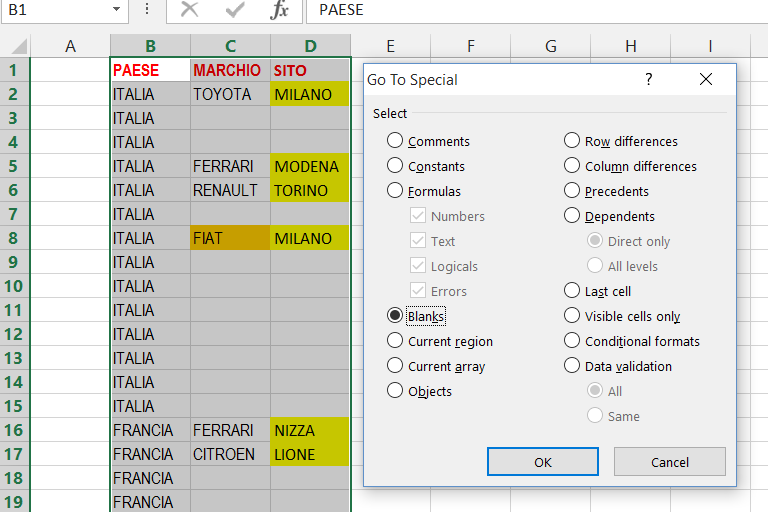 The remaining step is to convert all the generated formulas to text, which can be done quickly by selecting the entire table, press Ctrl-C, then Paste-Special as values. 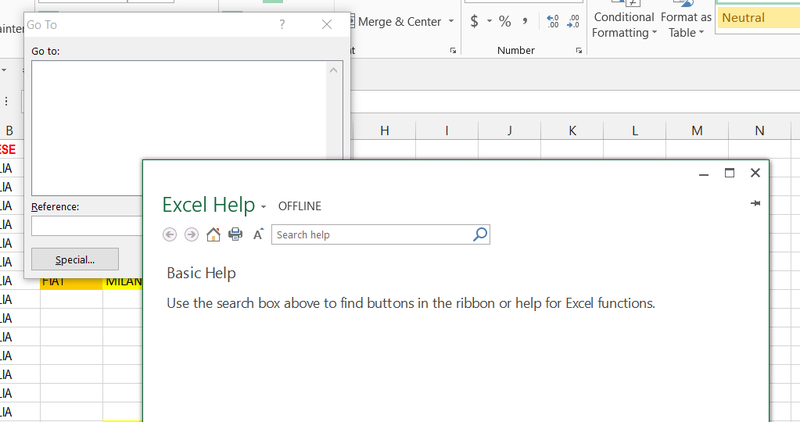 This entry was posted in Excel, VBA and tagged Excel, Excel Help, Filling Blanks, Go To, Go To-Special, Local Help deficiencies, VBA. Bookmark the permalink. Doug, it appears that there’s some kind of bug related to Goto Special Blanks, as per my post at http://dailydoseofexcel.com/archives/2015/02/10/go-to-special-blanks-no-longer-my-go-to-guy/. The bug: It’s incredibly slow on say a full column of data, unless you call it via VBA. I’ll be interested to see if you find the same. 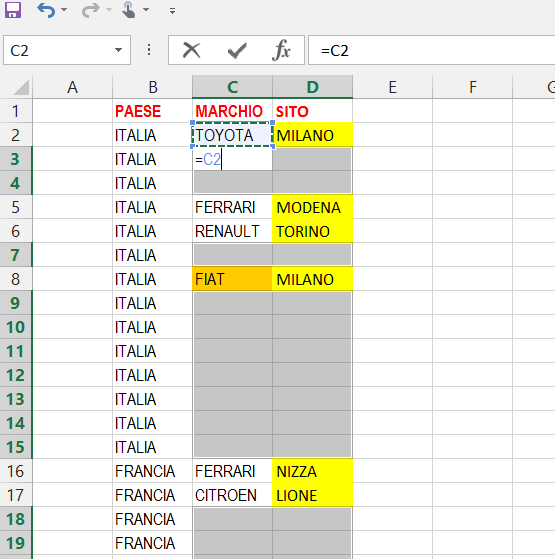 Try this: Select column A:A, and use Ctrl + Enter to enter say the number 1 into the whole column. 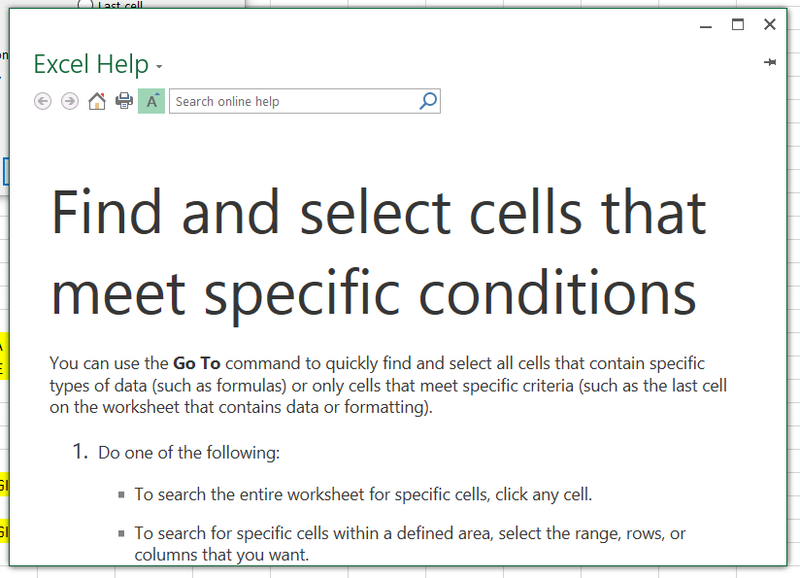 Now, delete one of the cells so there’s a blank, push F5 to bring up Goto Special, select the Blanks option, and cilck OK.
On my PC, that takes just under a minute. And all the while you can see cell references appearing in the Name Box. But calling it via Range(“A:A”).SpecialCells(xlCellTypeBlanks).Select takes just about one second. Weird. Hi Jeff. It took about 5 seconds for me, in an otherwise blank workbook. The cell addresses did show in the name box. That was with XL 2013 on a newish Toshiba lap top. What kind of time do you get when you type this in the immediate window? jeff – I tried this in a new sheet in a small existing workbook. With F5-special the time increased to about 7 seconds. Using the immediate window it took less than a second. In a sub with some Timer calls wrapped around it took 0.4 seconds the first time, reducing to 0.1 seconds thereafter. Performance was much the same with one blank near the top or with a couple of extra blanks added near the bottom. Now here’s something strange. I changed the range to “A:C” and the run time increased to 17 seconds. I then moved the timer range to column D and the time went up to 23 seconds. I had a formula in D3 (=D2-D1), but that wasn’t causing the problem. The time for just column A stays at 0.1 seconds. If I make Column A nearly all blanks the time goes up to 0.3 seconds. So going from one column to two increases the time/cell by a factor of about 20. I’m getting the same results as you. A:B takes less than a second. A:C takes 30. The problem seems to be to do with the used range. Debug.Print "Time Taken:" & vbTab & Format(TimeTaken, "HH:MM:SS") & " seconds." …which isn’t too bad: 4 seconds to identify 1048576 blanks. …which is pretty strange. 4 seconds to do the first million, three and a half minutes to do the next million. A possibility is that a single column is treated as being a single array with 1 million values, but two columns are treated as being 1 million arrays, each with 2 values. 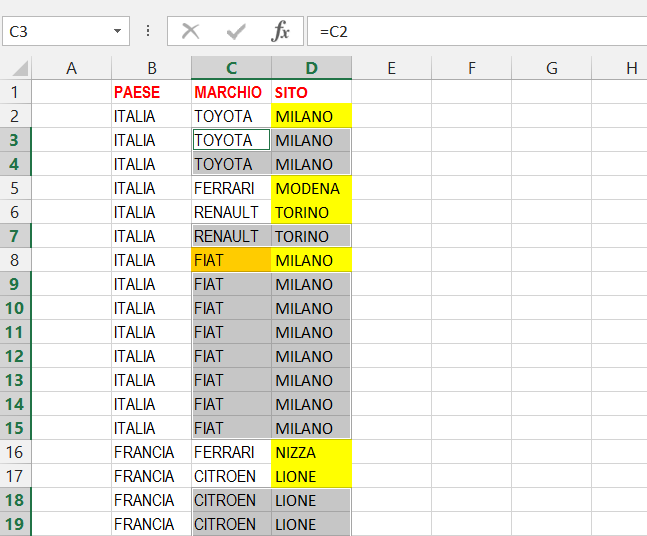 When the operation is done on the spreadsheet with F5-Special, the name box shows that it works row by row, rather than all of Col A then all of Col B.
I’m going to see how long it takes for 1 million cells, using all available columns. Good deduction, Sherlock. I think that’s it too, on reflection. Will update my DDOE post accordingly. How we can use that to speed things up with very long columns, I’m not sure. Other than working column by column. Jeff – I would say it is actually the number of rows that is the problem. One column works the same as one row, but for two or more columns each row is treated as a separate array, and that’s where all the overhead is occurring.